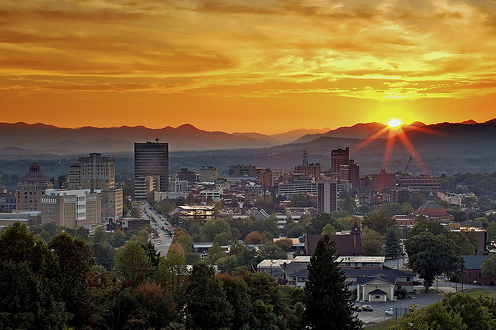 Asheville is a city in the Blue Ridge Mountains in the state of North Carolina in the United States. It is located in the eastern central part of the state in the mountainous regions and therefore has a somewhat cooler climate than other parts of the state. The city is serviced by air from Asheville Regional Airport, and lies at the intersection of three interstate highways. Asheville is an area rich in diverse cultures. From the inhabitants of the local mountain regions, to the nearby Native American settlements, Asheville attracts a wide variety of tourists. Most notably, the downtown region has become a gathering place for artists, musicians, and crafts vendors from all over the country. Most weekends, you will find some sort of festival going on in one of the many parks located around the city. 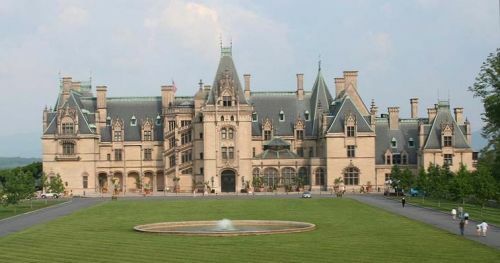 The most famous landmark in Asheville is Biltmore Estate, a French Renaissance mansion which is the largest privately owned home in the United States and can rival some of the old estates in Europe for scope and grandeur. The house and surrounding gardens are open to the public and a guided tour of the house can easily take up half a day. This is definitely a destination not to be missed. One thing to know before you go is that photography in the house is not permitted, so don�t be disappointed when you arrive. The mountains themselves are a major attraction and a drive along the scenic Blue Ridge Parkway is always a pleasant diversion. You can combine the drive to visits to nearby attractions, such as the Cherokee Indian Reservation, and the casinos in Cherokee, North Carolina. The Blue Ridge Parkway is a 500 mile scenic drive which wanders through the mountains from Virginia in the north, to where it intersects with Highway 441 in the Cherokee Reservation. Asheville has attracted a lot of international cuisine to the area, so finding good food is not a problem. While there, however, you should try some of the local food for some good southern cooking. There are many local eateries where the food is literally delivered from the farm to the table. If you are looking for something a bit more high end, there is plenty to choose from, and Asheville is actually home to several cooking schools teaching everything from southern cooking to international cuisine. There is plenty to attract the shopper to Asheville with its dozens of arts and crafts galleries, retail and antique stores and specialty shops. If it�s arts you are looking for, you want to check the calendar for one of the many arts festivals which spring up year around. Some of these are at or near Biltmore Estate or Gardens so you can combine two pleasures in one. If you are looking for a place to stay in Asheville, it is home to all the major chains, but there are plenty of local hotels and bed and breakfasts which can lend a bit more local color and charm. And be sure to bring the kids as Asheville has plenty of local attractions for the kid in all of us, from the Fun Depot, to beaches at nearby Lake Lure. And for the adults, there are some very nice Spas in the area to get pampered and relaxed. Meanwhile, check out any of the several championship golf courses in the area for a great game of golf in some amazing scenery. No matter what you like to do, Asheville has it all. 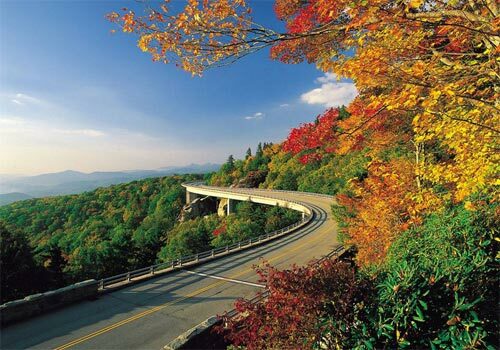 And if you want a relaxing vacation in some of the world�s best scenery, you can�t beat Asheville. For over 200 years, the Mimosa Inn has been famed for its hospitality. Situated in a setting of unusual beauty, it faces a range of nearby mountains including Big Warrior and Tryon Peak which reach about one half mile toward the blue sky. 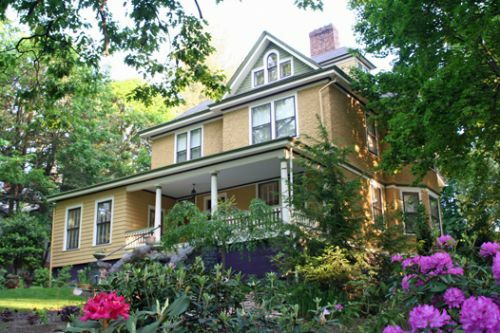 Asheville Seasons Bed & Breakfast is one of Asheville�s more intimate Inns with only 5 guest rooms. Located in the Montford Historic District, less than 1 mile from vibrant Downtown Asheville with fantastic retaurants, unique shops and art galleries, 2 miles to the Asheville River Arts District, under 4 miles to the Biltmore Estate, 15 minutes to the Blue Ridge Parkway, 20 Minutes to the Pisgah National Forest. Oak Hill invites you to experience the best of Western North Carolina. Situated at 3,600 feet above sea level in the The Great Smoky Mountains, we're just minutes from Asheville, The Biltmore Estate and The Blue Ridge Parkway. 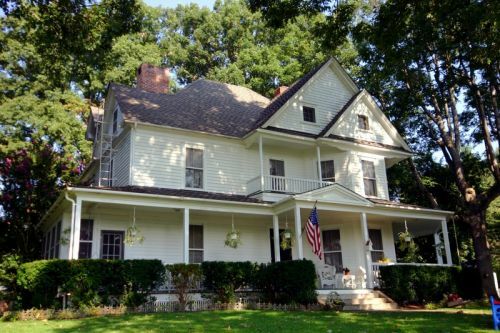 Our many years in the hospitality industry have been utilized to convert this lovely historic home into one of Waynesville's premier lodging opportunities. At Oak Hill Bed and Breakfast, you will experience "All the service and amenities of a fine hotel in the quiet comfort of a B&B". Grove Park Inn is one of the area's finest establishments. Sophisticated diners appreciate the elegant affair, which is set against the backdrop of the Blue Ridge Mountains. Dining establishments featuring a culmination of flavors perfected by more than two decades of Asheville dining history. Owned and operated by veteran restauranteurs Jay and Vijay Shastri, The Flying Frog Caf� is an eclectic journey through the eyes of a family rich with culture & diversity. Plan your Asheville North Carolina vacation and save with our 300-page free travel & visitor guide with 1,200 photographs that includes downtown Asheville, Biltmore, hiking, Blue Ridge Parkway, Buncombe County and surrounding counties and towns. Find out what to do in the Asheville area, a destination with a thriving arts community, diverse outdoor adventures, charming downtown, and numerous historic locations.